See the DVD presentation that recaps the events that happened that fatefull day that cost America over 2,000 lives, then takes a decidedly dramatic turn, to show you what did not happen on 9/11/01. Released on the 5th anniversary of the day that reunited America, made us all more patriotic, declaring war on the evildoers responsible for the horrors that took place that day. The producer of the presentation, David Masters, says, "I was affected by what happened that day, just like the rest of you... When I saw the first tower hit the ground, I fell to my knees." Then, the horrors continued to unfold before our eyes on CNN. Masters continues, "When the President declared war on the terrorists reponsible for the attacks on my America, I cheered him on, and hung my flag out on my porch, flew flags on our cars, honked whenever I saw a person waving a flag in support of the war on terror. I became more patriotic than I had ever been." Five years later, on September 11, 2006, after discovering inconsistencies in the 9/11 events, and the official 9/11 Commission Report, Masters releases the documentary that does not propose any conspiracy, theory or conspiracy theory, only factual depictions that occurred on September 11, 2001. 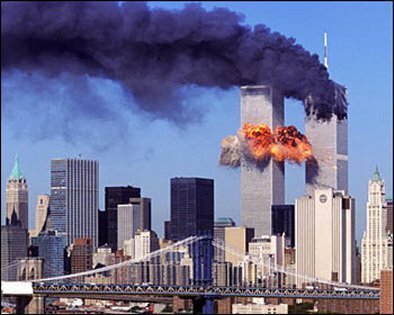 See what you missed, what you actually saw, without the confusing counter-story dialogue selling the idea that Osama Bin Laden was responsible for the attack on the World Trade Center, resulting in the destruction of Towers 1, 2 and 7. See for yourself by re-examining video footage that you have already seen, then ask youself if United Flight 93 actually crashed in that field in Pennsylvania. Examine the evidence, then ask yourself if you believe that a commercial flight actually crashed into the Pentagon, as we were told, after reconsidering the video footage for yourself. Then, find yourself asking more questions... "Like I did," Masters says, "Now I am much more cautious about my patriotism, and want answers. Answers that our Government is unwilling to address, and might threaten me with being prosecuted for treason, just by having the nerve to ask such questions." See the evidence for yourself. Share the facts with everyone you know. We all have questions that deserve answers from the White House and Washington DC. Or, choose not to see the facts. Producer, David Masters, states, "I wish I'd never found out the truth. I liked the 'safe' life that I led in my ignorance," and so, understandably, might you prefer not to view the evidence as revealed in the DVD. Reconsider 9/11 then, reconsider the facts, versus the Official Reports. Reconsider 9/11 and reconsider911.com © 2006 David M. Masters. All rights reserved.